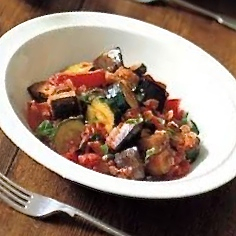 Tex-Mex Ratatouille is quick and easy to put together. 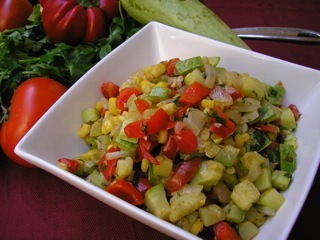 It’s a great way to get your teenagers, who seem to love tex-mex cooking, to eat a zucchini recipe. "Beef it up" to main dish status: just serve over rice topped with Planned Over shredded chicken or beef. For a dairy meal sprinkle with shredded cheddar cheese + crushed taco chips= Ra-taco-tuille! 1. Heat oil in a large skillet on medium high heat. Add onion and cook, stirring until it begins to brown. Lower heat to medium, add garlic and stir one minute until fragrant. Do not allow garlic to brown. Add zucchini, bell pepper and corn. 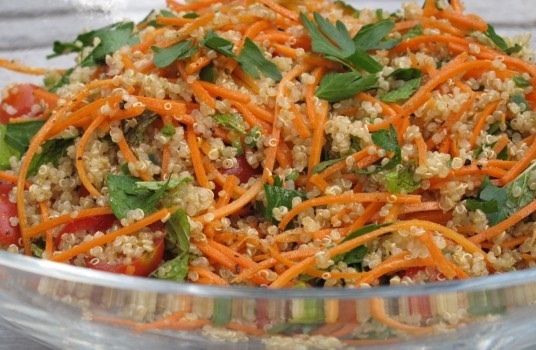 Stir, cover and cook until vegetables begin to soften, about 10 minutes. 2. Uncover, add jalapeño pepper, tomato, and cumin. 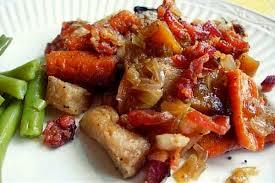 Cook uncovered, until vegetables are very tender, 15 to 20 minutes. Season to taste with salt and pepper. Stir in cilantro. Serve warm or at room temperature. Sneak Preview Recipe from the first edition of "Cooking for the King"